Newt Gingrich, speaker of the House: Politicians who cling to their old titles are pretentious, incorrect, and un-American. Politicians like Newt Gingrich who cling to their old titles are pretentious, incorrect, and un-American. Photograoh by Jessica McGowan/Getty Images. Newt Gingrich can be called many things: garrulous, grandiose, philandering. But one thing he should not be called is “Mr. Speaker.” Gingrich ceased to be entitled to that title when he left the House on Jan. 3, 1999. But you would never know it from the obsequious way journalists have addressed him during the campaign, where “Mr. 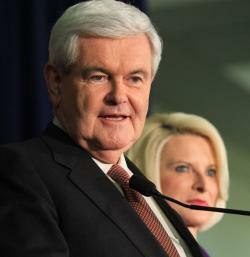 Speaker” and “Speaker Gingrich” have become standard. It’s as if he is Downton Abbey’s Earl of Grantham, his honorific adhering to him for life. But is there really any harm in humoring the pompous ex-official who enjoys that toasty feeling that being called “speaker” or “secretary” or “president” brings? I think so. Those who hold the highest offices in the land deserve a bit of deference. The problem arises when the people who hold those offices start to take the deference personally. To ease the shock of losing power, the former official, like a kindergartener taking a teddy bear to school, may prefer to cling to an old honorific. But our country was founded on the notion that certain people don’t get to lord it over the rest of us just because of the title they carry. It is rare to see politicians correct someone for over-inflating their title. Admonishing people who don’t give them their due is another matter. A good example of the latter came when Sen. Barbara Boxer verbally boxed the ears of a brigadier general testifying before her who, in proper military fashion when speaking to a high-ranking woman, called her “ma’am.” Boxer’s response: “You know, do me a favor. Could you say ‘senator’ instead of ‘ma’am’? It’s just a thing. I worked so hard to get that title, so I’d appreciate it,” In her last re-election campaign that moment was used against her as an illustration of her arrogance. But former officials who don’t set straight those who incorrectly call them by their old titles should come in for criticism as well. Even if Gingrich doesn’t twist journalists’ arms until they call him “Mr. Speaker,” he clearly basks in the undeserved esteem the title brings. (If you believe that, in declining to point out that he should be called “Mr. Gingrich,” the candidate’s real goal is to save others awkwardness and embarrassment, then you don’t know Newt Gingrich.) The websites of the presidential libraries are also lousy with references to President Carter and President Clinton. And if they didn’t want to be called “secretary” in their joint appearance at the World Affairs Council of Dallas/Ft. Worth, surely James Baker or Condoleezza Rice would have made that clear before they were introduced. And what of the reporters who slather on the titles? Journalists could argue they use appellations as sign of respect, but I think it’s a feint—a touch of obsequiousness before sticking in the shiv. So, as CNN’s John King’s did, you preface your question to Gingrich about whether he suggested to his second wife that they have an open marriage by calling him Mr. Speaker. But the press should get things right, and not implicitly misinstruct the public. Just think, a president returning to the life of a private citizen sans imperial retinue—how quaint. Robert Hickey, deputy director of the Protocol School of Washington and author of Honor & Respect: The Official Guide to Names, Titles, and Forms of Address writes that the rules of the road vary for former officials. Hickey says that for those who held offices filled by only one person at a time—such as president, vice president, secretary of state, and even governor or mayor—it is confusing to the public, and disrespectful to the current office holder, to hang onto the title. People with titles held concurrently by many, such as senators or judges, are not violating tradition by keeping their honorifics. In her book on American manners and their origin, Star Spangled Manners, Judith Martin writes that despite Americans’ reputation as being brash and uncouth, “we have had an enormous and beneficial influence on the way people everywhere behave.” Among our good work is modernizing the way people are addressed, “so as to minimize the differences between the weak and the powerful.” We diminish that accomplishment if we treat the once-powerful as if they have ascended to a peerage.